Genting Plantations Bhd operates oil palm plantations in Asia and has several oil mills to help with production. The chemicals extracted from the plantations can be used for multiple end-products, including lubricants, detergents, and other substances. Also, Genting Plantations developed properties to take advantage of its access to land. The developments have offered a mix of residential and commercial uses, and complete townships have been constructed with multiple amenities. The company also invests in the biotechnology industry. The investment focuses on techniques to improve yields and profitability of oil palm plantations. rlch 200 hectares of freehold property landbank and 8630 hectares of plantation landbank in Johor still valued at 1983 price base on latest annual report. If revalued base on current price how much does the value fetch? Any Johorean here can help to calculate? Anybody know; why GENP not declaring any dividend yet? Around this time frame last year, I use to get some money from GENP. rlch ko2004bb, they have declared special dividend last year so try to conserve cash which they need for expansion. This is a good long term stock where you can expect growth in earnings. Woi, if GenP can sell their land to EcoWorld, they can make huge profit. EPF buying 30,000 shares on 27/5/14 in today Bursa announcement. 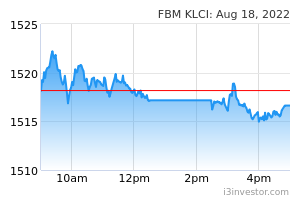 The trading that day was done between RM11.18 and RM11.34. ko2004bb Thank you, Rich for your update. I will certainly hold on to GENP for long term. So be cautious, no revalue does not mean the share price haven't reflect the actual value. rlch Up 28sen today after HSR announcement. Land in Johor to further appreciate? Time to buy warrant? rlch Past 1 month EPF buy a lot. As a plantation company they also own a lot of land for property development. Wonder when they can list their property arm like IOI to unlock value for shareholders. FOR the plantation sector, will zero CPO export duty help the industry as a whole?...from Starmobile.....@Ring....palm oil price @ 1900 can be disposed for biodiesel plant which is intact.The economists @ this conference r not sure of what they r talking or trying to sweep d truth under d carpet.Those giant plantation companies yield is only 20mt n d industry can collapse @ this yield.We have living examples like UP/KLK/IOI whose yield is above 23mt.What r they doing to increase d yield which shd be widely spoken by d top economist of d country. Govt is loosing plenty of revenue by abolishing export duty until Dec... the high yield will help to cushion d situation.Any expert economist or media writers shd elaborate on this...tks. rlch Latest TP by RHB RM 11.15. Buy warrant(RM2.5) for higher gain(TP RM3.40). rlch Now trading at discount after big jump in mother share price. Buy and convert warrant can make money. rlch US market record high, CPO up, Genting Plantation further up tomorrow? guiltytrader Good to buy soon as below 10.
guiltytrader better than some con man construction company. Regret holding so long. epfbuy Latest TP RM 11.60 and EPF buy. Time to buy? ivan9511 Hi there. good night . However I just check the dividen giving by GentingM and Genting bhd , and I find out Genting Malaysia diveidend more than Genting Berhad. Then why not just buy genting M and get the higher dividend . why those people still want to invest expensive counter but low dividend. Unless they want to rugi ? is there anything I should know ah ? pushparaj should see some window dressing, end of 2015.
pushparaj Epf buying. Think will go up. supermix88 pushparaj Epf buying. Think will go up. Hopefully lah as I had been holding this counter for quite sometime now, maybe the NINO effect will help. 鹅麟依旧≈ 扫地僧 Good morning to everyone. Hope you guys are doing well there. I'm watching CPO counters like FGV, GENP, Sime Darby, CEPAT and TDM(my favorite). Mid autumn festival and Diwali festive are around the corner so I do predict export volume slowly pick up and price will follow suit. Currently, CPO price must stay above RM2,253-2,259 should any price dip below this consider mission aborted. 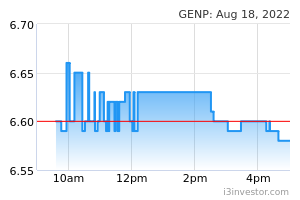 I'm buying GENP today for mid term investment. After FGV heavily acquired by LTH I'm shifting to Sime Darby as newly appointed PNB Chairman Tan Sri Abdul Wahid will strengthen Sime Darby's position as Top 3 most profitable GLC company. Because of this I also invest in Sime-C3 today. VivoPrince GENP has become a darling plantation stock once again. Prices have been holding steady at the RM11.50 region. Rainmaker6890 Talked to my friend in the meteorologist department, understand that La Nina is very unlikely and this will put a dampen to the supply. This on top of a bad harvest induced by El nino. Hence we can see why GENP rationalise the expected decline in top line contribution with the push into GPO. Expect to see a very stable sideway price movement until next year comes... Any purchase now is purely for door gift. shpg22 I think GENP need to stop giving out Special dividend to pare down its rising debts. shpg22 Terrible result, but price still well supported.